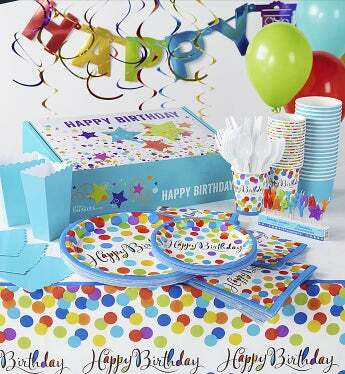 Plan your next birthday celebration in minutes with this complete party set for eight. The colorful birthday candles spell out "Happy Birthday" in a fun and festive way. This set for 8 includes 7" plates, 10.5" plates, 3 piece cutlery sets, napkins, party cups, treat boxes, and treat cups all beautifully coordinated in Confetti Bash and Caribbean Blue. - One 14 piece set of Happy Birthday Candle Picks - each candle is shaped like a letter which when placed together on the birthday cake will spell "Happy Birthday" in a rainbow of colors. - Eight each rainbow colored Confetti Bash pattern 7" plates, 10.5" plates, drinking cups, and luncheon napkins.